How might we amplify disruptive thinking in education to bring about positive change in our community? 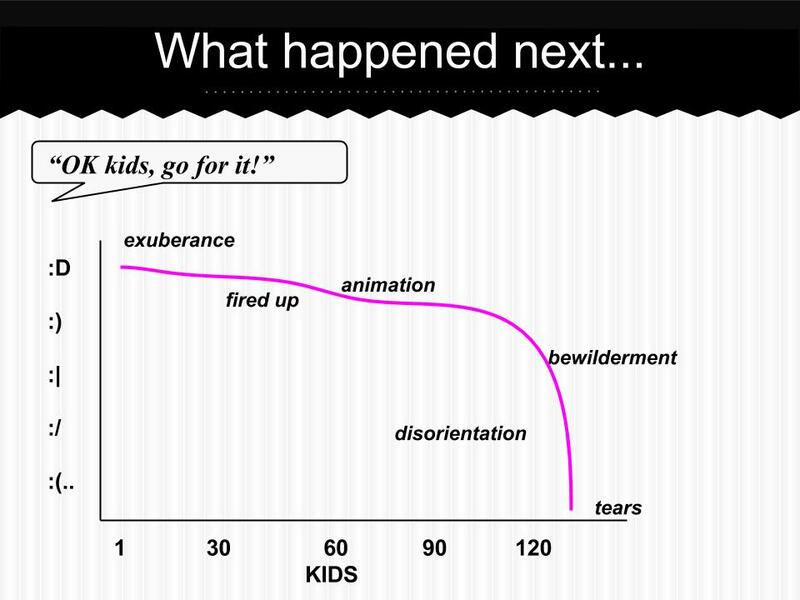 – A #GTASYD moonshot. 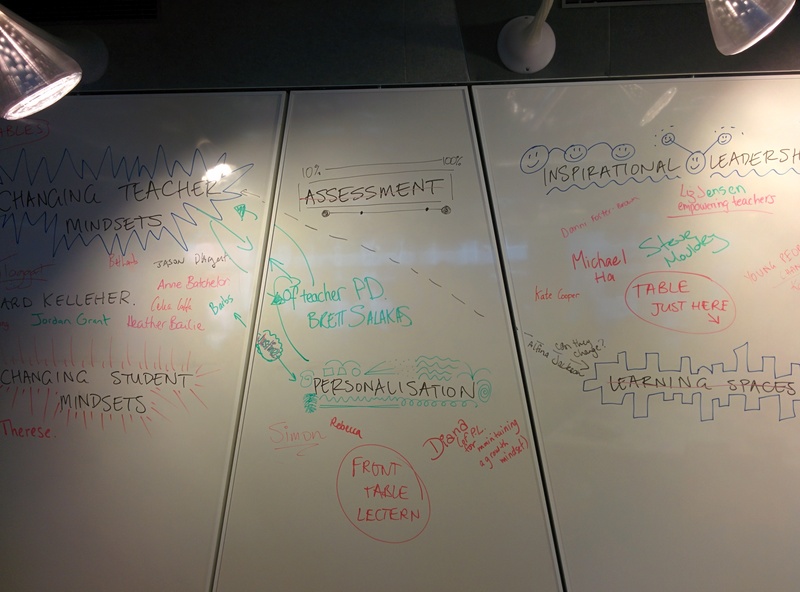 As part of my moonshot from the 2014 Google Teacher Academy in Sydney, I am seeking ways to highlight disruptive thinking and ideas in education. How did I arrive at this? A striking difference from previous academies was that a Design Thinking process was employed, as a vehicle to generate a problem for solving and creating sustainable change by educators who attend the academy. Attendees were encouraged to think about an area of interest and a “chunky” problem that they wished to solve. These ideas were to be brought to the academy for further investigation. It was during the immersion phase prior to the academy and within the very early stages of the 1st day that I started to narrow in to an area of interest….that of system reform, hack schooling, or disruption in education from traditional norms and systems. My overall sentiment on this issue is that often in schools we are bogged down by the day-to-day structures and internal / external forces and influences that dictate the learning for our students. Coupled together with fixed-mindsets, schools can be hard places to change, and at times, difficult for re-imagination to take place. Whilst there are pockets of innovation happening around the globe, we can’t really say that education has hit it’s mass tipping point as yet. This was confirmed during the synthesis phase where fellow attendees at the academy were grouped to think critically about their area of interest by using hexagonal thinking. The aim of the exercise was to think of the factors within the issue and consider where the links and connections exist. Whilst the hexagons can be placed in an almost infinite number of ways, here is just one way of viewing the problem with all signs pointing to “conformity”. (Humorously, the group decided that the the surrounding factors around conformity were too many, so therefore justified the use of a 7-sided shape). ACTION: Amplify – Encourage, highlight and celebrate were considered but to amplify means to make louder, increase, magnify, intensify, or heighten. I have chosen this word because I believe there are already great things happening in some schools which we should bring to the forefront for everyone to see, and that if we can create stimulus and aim to change mindsets in “laggard” schools then we might just reach a tipping point in education where we can realise a whole vision for the future of education. WHAT: Disruptive Thinking – includes ideas, systems, process and models which throw away or “hack” the traditional norms of education and are not encumbered by the status-quo. WHOM: Education – including all stakeholders. Educators, parents, students, systems / bureaucracy. CHANGE SOMETHING: Positive change in our communities – This idea is two fold. First, that through disruptive thinking we are made aware of the possibilities for improving schools and ultimately students. Secondly, that the impact is not only on students in the present within their school and community, but for life and therefore making an impact on wider communities. If this moonshot is to be a reality, I believe that we would see an incremental improvement in the conversations that take place around education reform, and the actions that schools take place around the globe to bring positive change in their communities (10x thinking). I aim to make this moonshot a reality with a two pronged attack. Firstly, I wish to make an impact within my own school community. I will need to consider the influencing forces in my school setting and the avenues to hack / rethink to improve opportunities for schooling. Having said this, I think my school setting does “buck the trend” from the status-quo in a lot of ways but there are always opportunities for improvement. Moreover, I hope to use these experiences as learning opportunities for myself and our school which can be shared to the wider community. Secondly, I wish to examine what is happening locally, nationally and globally in education in regards to disruptive ideas. I aim to curate resources which highlight narratives of rethinking education which is not encumbered by traditional norms or influences. I also aim to share and provoke wider professional networks through teacher PD, conferences, and social learning networks. Last week at the academy I created a Google Form and sent this out to my PLN. The aim of the form was to immerse myself in the problem again, and find out what other educators around the globe think about this issue. I am also using it to connect with people and to find out whether they are willing to help me curate some of the interesting ideas around disruption. Please re-share in your communities! Last week I had the privilege of attending the Google Teacher Academy in Sydney. I had every expectation that the academy would be 2 days of high-energy thinking, mind-stretching paradigms, and dialogically rich conversations with existing and new-found members in my PLN. In this regard, the academy didn’t disappoint. As other’s have already pointedout, this year’s academy and possibly subsequent academies are taking a new direction in the way that attendees are selected, inducted and sent forth from the academy. Under the guidance and incredible facilitation of (NoTosh) Tom Barrett and Hamish Curry, this year’s intake had the prowess and wisdom of previous Certified Teachers from Sydney 2013 as mentors. Attendees were supported by teams and were stepped through a Design Thinking process as a vehicle of empowering attendees to create sustainable change in school communities. It goes along way to answering the question, “how do you personalise learning for 50 incredibly passionate teachers?”, let alone those who are already “Google Savy”. For me, the process was very suitable for exploring problems in our school communities and seeking the opportunities for positive improvement. It meant that teachers could tailor the two days towards their own visions for education and make something meaningful of it. //platform.twitter.com/widgets.jsA large part of the academy is to bring to fruition a Moonshot, that is, an incredible idea that could make all the difference yet is seemingly impossible. In the early stages of immersion, themes were collected of all the topics that educators were interested in developing moonshots . Noting these it was interesting that they included common ideas in our professional practise like changing teacher / student mindsets, assessment, personalisation, leadership, learning spaces, pedagogy, curriculum development, change beyond the classroom, and even the notion of hack schooling or complete system rethink. Of all these interrelated issues, a similarity found in all was that they were about forces of change for the better of education. 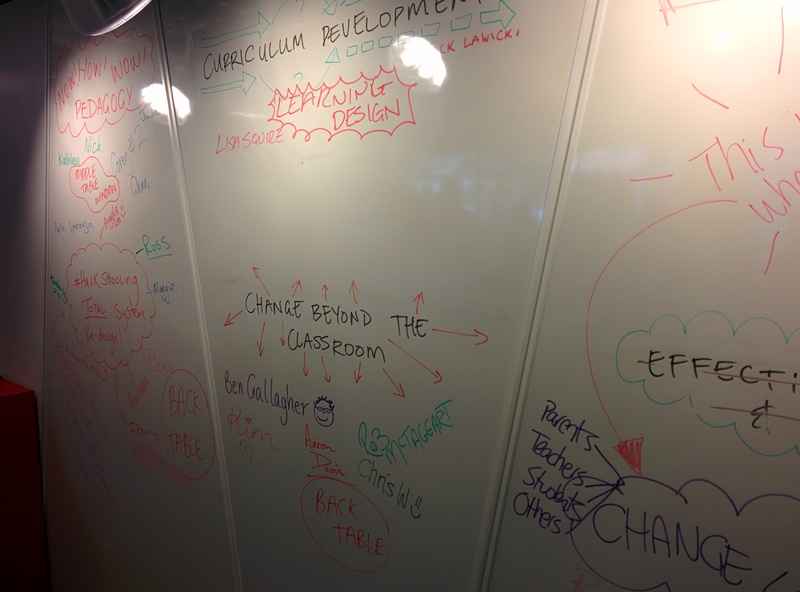 My own moonshot that I have developed from the academy is along the lines of hack schooling, system rethink, and disruptive learning…more on those in another blog post! For me, the Google Teacher Academy was incredibly energising. The most important part was not the fact it took place in a Google office, or that we used / discussed Google tools, or even technology for that matter. The most important parts were the connections that were made, the challenging conversations that took place, and the energy and belief that gripped each of us in those rooms that we can make a powerful difference within and beyond our school communities. At the end of the two days we were asked to develop a six-word memoir that encapsulated our feelings at that point. I believe the memoir I developed (Dare to dream and discover empowerment) is a reminder not only for myself, the community of GCTs but all educators…that we have a responsibility to ourselves and to grow the profession together. Huge props to not only to Google Education Evangelist Suan for the GCT program, but also Chris Harte who has been an inspirational and provocative mentor for Team <x>. So you think you are using technology to “Transform” learning? At ISTE 2014 in Atlanta, I attended Alan November’s session on “Learn to Learn: First 5 Days of School”. Alan spoke about the opportunities within the first five days of the school year, and the range of activities and pedagogies that could be “invested in” during that time and carried into each term. Whilst the topic of conversation was very interesting (See the November Learning resources and #1st5Days), there was something else that sparked an interest in me. Alan showed a set of questions that he had been working on, named “Six questions to ask for transformed learning”. Alan’s point was that the we ought to consider more frequently how much of our use of technology IS in fact transforming classrooms. His questions could be used to “test” or analyse assignments, as one can easily get carried away in the urgency to use technology but not consider how in fact it is improving (or hindering) the learning process or opportunities. 1) Did the assignment create capacity for critical thinking on the web? 2) Did the assignment reach new areas of teaching students to develop new lines of enquiry? 3) Are there opportunities to broaden the perspective of the conversation with authentic audiences from around the world? 4) Is there an opportunity for students to publish (across various media) with an opportunity for continuous feedback? 6) Were students introduced to “best in the world” examples of content and skill? Upon reflecting on Alan’s questions I thought that they ring true; in that if the answer is no to all of the above, then there is a danger that technology has merely substituted the task and not transformed it in any way. Educators often talk about how apps or software are “transformational” because they are engaging or motivating, or personal devices that are in the hands of students hands lead to transformational “approaches”. For me, the transformative opportunities in today’s digital age with technology are when the technologies are used to connect, share and widen classrooms, which in my opinion, are scarcely met in a genuine sense. 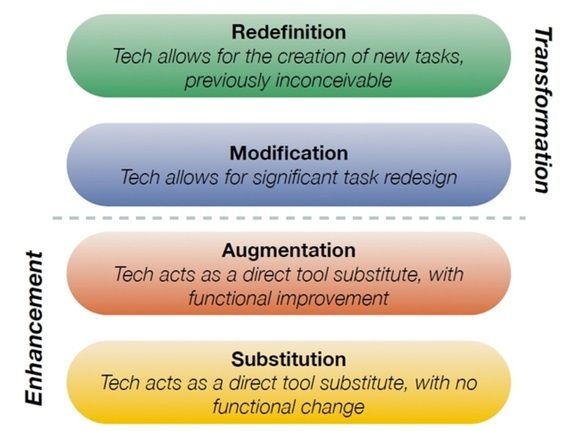 According to the SAMR model above (Dr Ruben Puentedura), transformation occurs when the technology has allowed for significant modification of the task and / or created new opportunities which were previously inconceivable. For more on SAMR, see Kathy Schrock’s awesome guide. Taking Alan’s questions, I have modified them slightly and improved the wording of them for teachers to use more succinctly to get to the heart of the question; so that they could be used to think about whether technology is indeed transforming learning and teaching in classrooms. The first change you might notice is that I have modified the word “assignment” to task. Assignment to me brings connotations of a moment in time, a “project”, and often used as an assessment piece. To me the word task is a lot more applicable yet still suitable to learning opportunities in the classroom. 6) Does the task expose students to “best in the world” examples of content and/or skill? – The extent to which the technology is used to demonstrate high quality examples of the learning objective’s content and/or skills. Educators, what do you think? I would welcome you to “test” these questions to analyse tasks or curriculum against the SAMR model. Do you agree with Alan November? Would you include anything else in this set of questions? As part of my Google Teacher Academy application, I have made a provocation that can be used for critical and creative thinking about the opportunities of transformational learning with technology. This might be useful to view when planning for deliberate tasks, or consider when delivering of lessons, or for post evaluations and analysis of tasks or curriculum. The Google Apps For Education summit and all of it’s “Googly Goodness” doesn’t kick off until tomorrow, but this afternoon +Riss and I had the pleasure of attending a pre-summit tour of the Sydney Google offices hosted by +Suan. +Riss asked +Suan a very provoking question, “What characteristics does Google look for in their employees?”. His responses echoed sentiments of what Intel told us last year on the ACCE13 Study Tour, that Google employees are to be open minded to the constant of change, team players and collaborators, and skilled at finding problems and designing solutions. …how much of our teaching & learning is genuinely geared towards team work, problem finding, designing solutions and a healthy attitude for the unknown? Moreover, if teachers are not open-minded to change, how can they expect their students to be? Taking these questions as a lens will be a great way to kick off tomorrow’s summit!